Perhaps you had a childhood filled with Catholic devotions. Your family prayed the rosary together. You marked the nine days before feast days that were special to your family with novenas and you had special celebrations on the feast. Life had a distinct cadence within the rhythm of the church and you brought all those devotions to your new family. Or maybe you are a convert and you'd never heard of such things until recently.Now, devotions seem a strange, cultural practice of group to which you belong but with whom you are not entirely at ease. Let's talk for awhile and learn together what devotions can mean to a family's faith life. At the end of the podcast, I asked Leila what her favorite devotion is and she shared with us what St. Joseph has meant to her throughout her faith journey. Then, she surprised me by posing the same question to me! 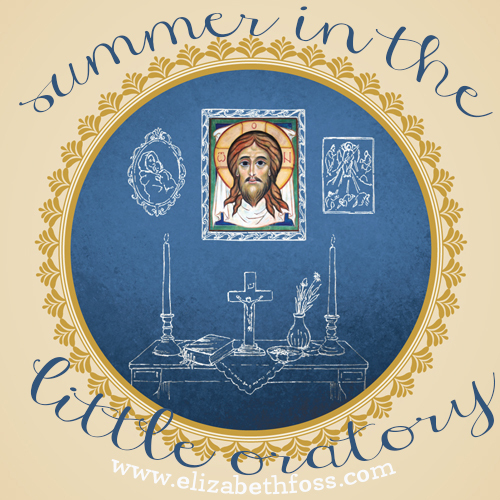 I share her love of St. Joseph and mentioned my daily (hourly) connection to him. Throughout the day yesterday though, after we'd finished recording, I thought of other devotions to which I am very attached. There is St. Andrew, wonderful soul whom I love to share with others. and there is St. Anne, who found me just about six years ago and who has grown dearer this year as I've added "grandmother" to my roles in life. There's St. Therese, whose story has never quite been properly told here, but who is absolutely, positively, integrated into our daily life. I look at this list of weekly and monthly devotions in The Little Oratory and I think for a fleeting moment that I'm missing so many! And then I stop and consider how we've made so many our own throughout the years. I encourage you to pray that certain saints find you. And when they do, take them into your home and let them live there. Leila has a place now at her blog for each of us to share a link to oratory pictures. I really think the more visuals, the better, so please go join the party over there. But before you go, do stop and talk about this podcast. I love to know you're listening and to know what you're thinking. As you read, if questions pop up, please don't hesitate to mention them here and I'll see if we can get you some answers in future podcasts. I'd love to hear what you're thinking!